Hi, I am writing in regards to the property at *** Gulf Shore Blvd N #801, Naples, FL 34103. Please send me more information or contact me about this listing. This highly desirable and rarely available unit in the 01 stack of the prestigious Le Parc building affords panoramic Gulf and Bay views. The beautiful entry foyer opens to the spacious great room with a custom built-in wall unit, a dining area and a wet bar equipped with a sink, ice maker and wine rack. 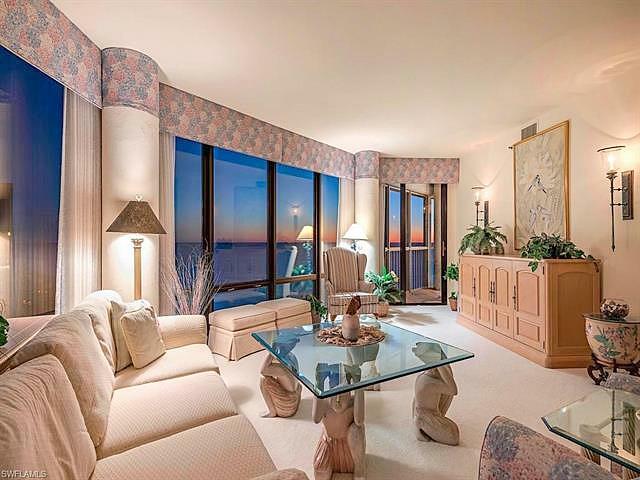 With stunning direct Gulf views and balcony access, this great room provides an indoor and outdoor entertainment space. The focal point of the generous master suite is the alluring extended Gulf views from the adjoining balcony. Family or friends will also enjoy the incredible Venetian Bay views from a second bedroom with a walk-in closet and an en-suite bathroom. Le Parc offers 24-hour security and a gated entrance for added security. Owners have the privilege to enjoy true luxury condominium amenities including a breathtaking beachfront pool and spa, a modern fitness facility, sauna facilities, locker rooms, a Har-Tru tennis court, 2 guest suites, under building covered parking spaces and a large reception room with a catering kitchen. Boat docks are available to lease or purchase through the Venetian Bay Yacht Club.This rent to own home is a townhouse or condo located in Naples. It offers in size, 2 beds and 2.5 baths. Review its detailed information and determine if this Naples rent to own has the qualities you are looking for.